You're probably thinking it's next to impossible to partake in the joys of tuna noodle casserole without ingesting too many calories and fat grams. Fortunately, you're wrong. Thanks to the miraculous Shirataki Noodles that never cease to amaze us, you can whip up a snazzy, noodlicious casserole in no time. And it'll taste just as good as (if not better than) any other you've had. Don't believe us? Try it and see. Preheat oven to 375 degrees. Rinse and drain noodles well. Cut noodles (so they're not completely unwieldy). Microwave noodles for one minute and pat dry. Melt Laughing Cow Light cheese wedge into noodles, microwaving again for 20 seconds if necessary. Mix cheese wedge thoroughly into noodles. Add tuna and peas and stir well. 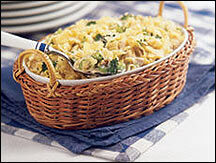 Put noodle/cheese mixture into a casserole dish. Add your can of soup and one tbsp. of parmesan and mix well. Season to taste. Top with remaining two tbsp. of parmesan and bake in your preheated 375-degree oven for 20-25 minutes. Enjoy. Serves 4. *Use cayenne only if you like foods with a spicy kick! 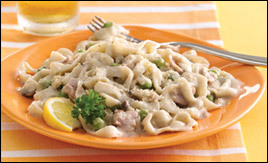 Tuna noodle casserole became popular back in the early 1940s, thanks to a recipe made famous by none other than Campbell's. Looking for ways to promote their Cream of Mushroom soup, they created recipes that used the product, and this one stuck. In fact, soon after Campbell's promoted their recipe, this dish became all the rage. No surprise there, though, since it's typically made with deliciously-fattening calorie-packed things like creamy soup, milk, butter, noodles and cheese. Eeeks! Just forget everything you know about old-fashioned, fatty tuna casserole, and whip up a batch of HG's Rockin' Tuna Noodle Casserole today. Your friends and family will be mighty impressed. Today, July 25th, is National Hot Fudge Sundae Day. If you plan to celebrate, we recommend going for portion-controlled versions, like ones made by Weight Watchers or Skinny Cow. Share this tuna-rific recipe with humans all around the globe. Click "send to a friend" NOW!